Since the establishment of the brown marmorated stink bug, Halyomorpha halys (Stål) (Hemiptera: Pentatomidae) in North America and Europe, there has been a large, multi-group effort to characterize the composition and impact of the indigenous community of arthropod natural enemies attacking this invasive pest. In this review, we combine 98 indigenous natural enemy datasets spanning a variety of sampling methods, habitats, and geographic areas. To date, the vast majority of H. halys biological control research has focused on the egg stage, using sentinel egg masses to characterize indigenous parasitoid and predator communities and their contribution to H. halys egg mortality. 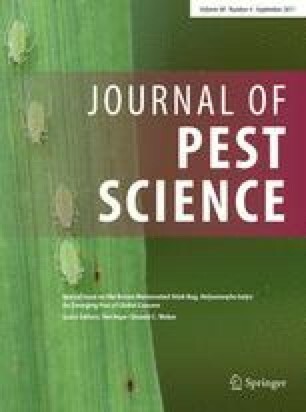 Although egg parasitism and predation levels by indigenous natural enemies are low (typically <10% each) in most surveys, total egg mortality attributable to natural enemies can be higher (typically between 5 and 25%; up to 83%)—even though these values were likely underestimated in most cases because some mortality due to biological control was not recognized. In North America, where the most data are available, it appears that the relative prevalence of different indigenous parasitoid species varies among habitat types, particularly between crop and non-crop habitats. Predator species responsible for egg mortality are much less commonly identified, but appear to include a wide variety of generalist chewing and sucking predators. To date, studies of natural enemies attacking H. halys nymphs and adults are relatively rare. Based on our review, we identify a number of key research gaps and suggest several directions for future research. The online version of this article (doi: 10.1007/s10340-017-0891-7) contains supplementary material, which is available to authorized users. The authors wish to thank the following for research assistance collecting data used in this review: Clint Fleshman, Dana Martin, Chad Kramer, Lindsay Stump, Chelsea Berish, Sarah Detraz, Waydon Yates, the UKY farm crew, Emma Thrift, Treva Rowley, Nathan Erwin, Rose Borror, Zachary Johnson, Heather Leach, Megan Lowlor, Brooke Merrill, Devon Newsom, Gary Parason, Ryan Paul, Trisha Samota, McKenzie Allen, Brittany Poling, Morgan Douglas, Samuel Brandt, Torri Hancock, John Cullum, Adam Cave, Tina Dancau, Dennis Quach, Chris Hughes, Lot Miller, Kathy Wholaver, Katy Ellis, Silvia T. Moraglio, Marco G. Pansa, Kathy Tatman, Kylie Mendonca, Kody Transue, Max Sinton, Andrew Lyons, Elizabeth Fread, Abigail Rosenburg, Jeremy Turner, and Steve Schoof. We thank the following grower cooperators: Jeff Dickinson, Mike Laughlin, Sue Borton, Guy Ashmore, Redbud Farm, Barry Rice, and Scott Slaybaugh. Funding for the work synthesized in this review includes grants from the USDA-NIFA-OREI No. 2012-51300-20097; USDA-NIFA-SCRI Nos. 2011-51181-30937; USDA NE-1032 Multistate Hatch Project; Federally funded Specialty Crop Block Grant 13054, administered by the California Department of Food & Agriculture; State Horticultural Association of Pennsylvania; Pennsylvania State University Hatch Project No. Pen04619. The USDA does not endorse any commercial product mentioned in this research. USDA is an equal opportunity provider and employer.